Yes, it is. One. of. those. Mondays. The one that follows the loooong weekend where you were constantly on the go and yet, here we are, Monday morning feeling as if nothing has gotten done. Not one productive thing was accomplished all weekend. 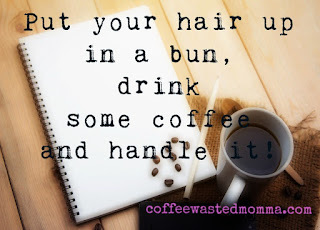 "Put your hair up in a bun, drink some coffee and handle it!" 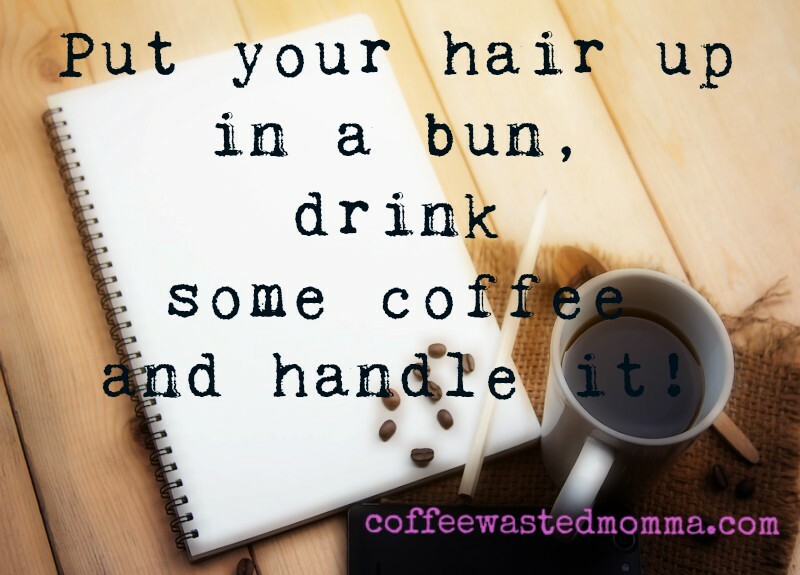 I have no idea who coined this phrase, but I'm going to make a safe bet that it is an overwhelmed, over worked, over... or under caffeinated, under paid, under appreciated, and sleep deprived Momma! Today, I am that Momma! I had such a great weekend filled with fun, family, softball, pumpkin festival, great food, and just all around goodness. We definitely kept busy and enjoyed the glorious weather we had! With all the running around and fun packed days, there comes the Mondays that you want to do absolutely nothing.We need a day to rest and recoup. We rarely get those days, do we? Some how, someway(with coffee and a prayer), we just keep going. We have littles to tend to, chores to be done. If we are super lucky, there may be a shower and an actual fresh, hot cup of coffee. Not the stale mug of tar and scalded milk that has been reheated 4 times and still sits in the microwave waiting to be remembered. When they don't need us to be up with them...and the roosters. When we aren't rushing to fill those demanding schedules. When we can actually match those schedules with the coffee pot timer. When our mornings are calm and quiet. That is when our coffee won't seem so important or so sweet. I won't say there will be a day that I won't need that coffee, but I won't rush to the days it is easier to enjoy it. I love my crazy, chaotic, zombie mom mornings. The ones where I know I am needed. I am loved and welcomed. I will treasure those days as I wander through the house picking up dirty socks while trying not to spill my cold coffee on the floor I already forgot to mop! For today I am "CoffeeWastedMomma"! I will be for more days to come and I will treasure them. With my hair wadded up in a bun, while I handle it! How do you handle Mondays? What is your biggest Monday challenge? Labels: coffeewastedmomma, momma life, Mondays, What's that quote?